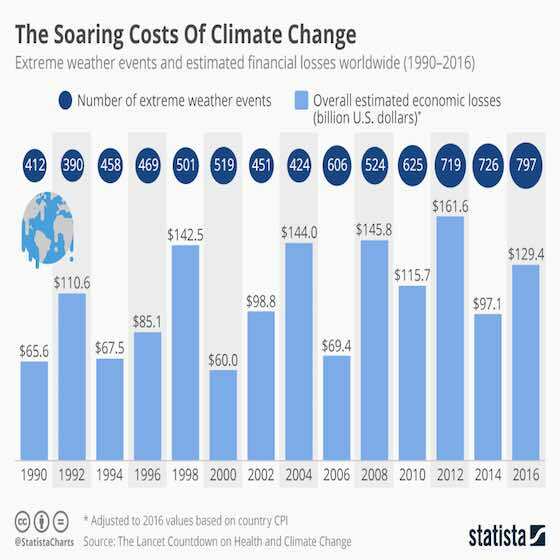 This chart shows extreme weather events and estimated financial losses worldwide. A new report has found that climate change is having an enormous negative impact on global labor productivity, the spread of infectious diseases and exposure to heatwaves and pollution. The inaugural report from The Lancet Countdown on Health and Climate Change also found that weather-related disasters are becoming increasingly common with an average of 306 events attributable to extreme weather occcurring every year between 2007 and 2016, a 46 percent increase since 2000. Mainly storms and floods, these disasters are causing catastrophic levels of economic damage around the world. For example, Hurricane Katrina inflicted $108 billion (2005 dollars) in economic losses, about four times as much as Hurricane Andrew in 1992. The threat posed by climate change and resulting extreme weather can be seen from the following infographic. Ten years, ago there were 606 extreme weather losses with a bill of $69 billion. Last year, there were 797 weather-related disasters worldwide, resulting in $129 billion of economic losses. Environment: "The Soaring Costs Of Climate Change"